The Malmsten Swim Open Stockholm are pleased to present the great team from Energy Standard for this years event. More information here. Today the Nordic Swim Tour organisation team are extra happy, one of the greatest female swimmers of all time just announced her participation for this years three events - Welcome Katinka Hosszu!!! Katinka hardly need a deeper presentation, with her THREE Olympic Gold Medals , TWENTY-FOUR World Championship Gold Medals and THIRTY European Championship Gold Medals she´s an icon in the fantastic sport of swimming. Katinka is this year doing all the three events in the Nordic Swim Tour, she starts in Helsinki before going to Bergen. And then she do the grande finale in Stockholm. It´s going to be something extra for all her fans to follow her races! We are of course very excited to have Katinka in the tour beside the other great female superstar Sarah Sjöström. Yeah - that´s right - the two biggest female superstars on this planet are both doing the full Nordic Swim Tour!!! 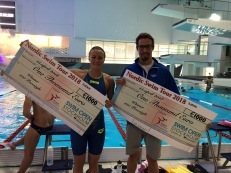 Sarah Sjöström and Pieter Timmers where two of the first prizewinners in the new Nordic Swim Tour 2018.